We are on the final stretch of the NC Common Core Commission. Next week is their final meeting and their recommendations on Common Core are due to the State Board of Education and legislature by December 31st. The final meeting is next Friday, December 18th from 1 to 5 pm. Please attend if you can. Details: State Board of Education Meeting Room at the Dept. of Public Instruction, 301 N. Wilmington Street, 7th floor. The war on the Academic Standards Review Commission (ASRC) is already being waged in the media. Pro-Common Core mouthpieces from ‘education nonprofits’ are coming out of the woodwork with Op Eds attacking the ASRC. This media blitz is also an effort to silence the public and the parents who have been fighting for their children for the last four years. DON’T LET THEM! I’ve heard from a few sources that there are representatives from various pro-Common Core entities making their way through North Carolina this past week and are paying visits to the State Board of Education members. I also am told these entities, including the Gates Foundation, have deluged the board with letters urging them to keep Common Core and ignore the commission entirely. Citizens can counter these Op Eds, meetings and letters with one of their own, urging the board to take the Commission’s recommendations seriously and act on them. The Academic Standards Review Commission (ASRC) as appointed to make suggestions to replace Common Core and they have done just that. The ASRC has met for 15 months and in that time, they have done the work that the Department of Public Instruction refused to do five years ago. The ASRC has done significant due diligence, including surveys to parents and teachers, listening tours around the state, heard testimony of experts from both sides, studied multiple different sets of pre-common core standards from various states and has developed working groups that have thoroughly picked apart the standards. The ASRC found serious flaws in both the English Language arts and in the Math standards. These flaws are most egregious from Kindergarten to Third grade — the years when our children are getting the foundational learning. Serious issues were also raised with the quality of literature and with the math progression (integrated math) in high school. It should be known that between 2009 and 2011, the Department of Public Instruction was well aware of the same issues the ASRC has found, yet they did nothing to correct it. It took parents protesting and legislators creating the commission to get anything done. 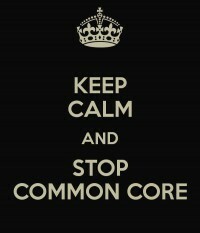 More resources are located in the Stop Common Core repository on my personal blog. Below are the email addresses for the NC State Board of Education. I would suggest copying your state level elected officials on these emails as well. If you are unsure who represents you, use the NC General Assembly’s Lookup Tool. State Superintendent Atkinson is also on the board, however is a non-voting member. Contacting her would be an exercise in futility since she has made it clear she stands with Common Core and not our kids. Also, over the last year, she served as President of the Council of Chief State School Officers (CCSSO), which is one of the two unaccountable D.C. trade organizations which hold the copyright on Common Core. By the way, Atkinson has announced she will run for reelection. She is already currently the longest-serving K-12 education official in the country. This entry was posted in Academic Standards Review Commission, Common Core, EDUCATION, NC Board Of Education and tagged Academic Standards Review Commission, ACTION ITEM, ASRC, NC State Board Of Education, NGO. Bookmark the permalink.